Contracts are open source based. And most developers use the public contracts at the start of the project to modify or simply include them. This is project-oriented centralized development and I think it is a waste of resources. Therefore, we propose to make dApp or contracts component-ready for use in other services. There have been suggestions for modified tokens based on erc20, but since many tokens have already been built on erc20, it is necessary to increase the utilization of already developed erc20 tokens. Therefore, we propose a universal wallet that can use erc20 tokens universally. We also propose a component dApp that allows you to create and save your avatar (& social badge system), and use it immediately in other services. All of the dApps suggested in this document are based on decentralized development and use that anyone can create and participate in. While many projects are under development in an open source way, they are simply adding and deploy with open sources to their projects. This means that you are developing a centralized service that uses your own dApp-generated information on your own. In order to improve the block chain ecosystem, all resources created by dApp and placed in the public block chain must be reusable in another dApp. This means that you can enhance your service by exchanging the generated information with other dApp. 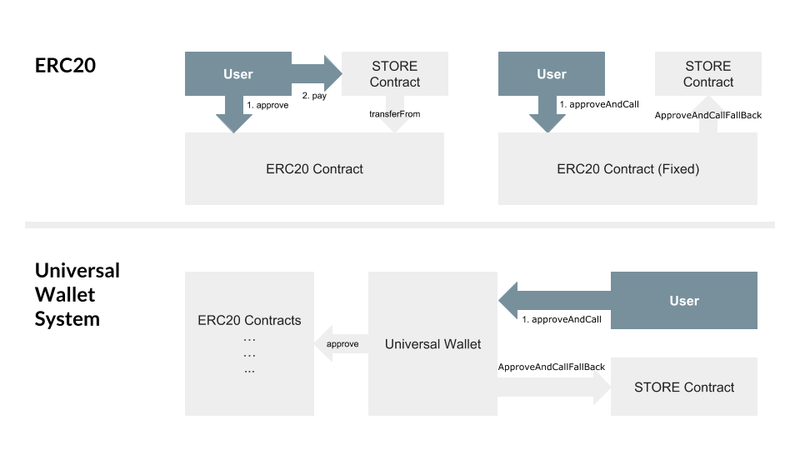 Likewise, ERC20 Tokens require Universal Wallet standards to be easy to use for direct transactions. Seeds for improvement of the blockchain ecosystem. Synergy - With other dApps and resources. Enhanced interface - For ERC20 tokens. Easy & Decentralized - Everyone should be able to add to their services easily, without censorship. 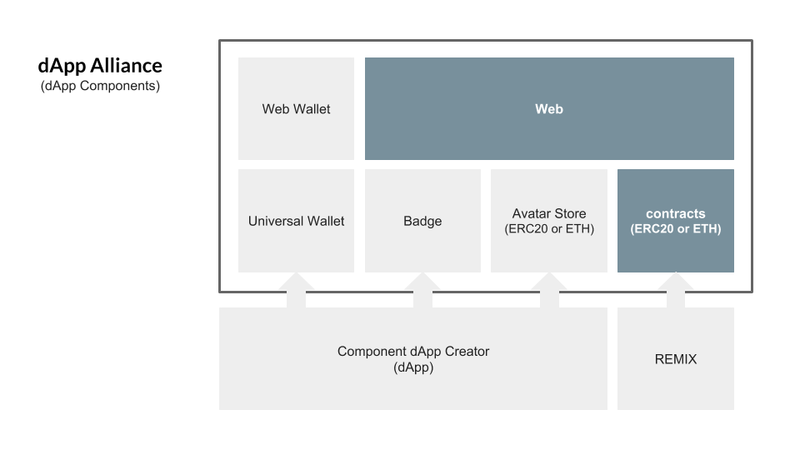 The following avatar store, badge system, and universal wallet are kind of examples about component dApp. The avatar store is created after ERC20 currency is set. You can customize asset category & viewer script. 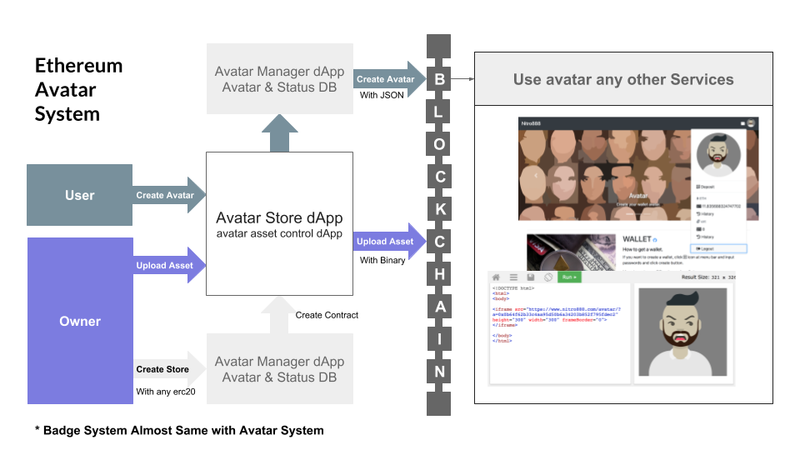 The avatar’s information & assets are stored in the event log part of the block chain. ** The avatar assets from Avataaars developed by Fang-Pen Lin, the original avatar is designed by Pablo Stanley. 2.3. And ApproveAndCallFallBack contract for Fixed ERC20. However, many ERC20 tokens are not prepared. We propose a Universal Wallet to solve this problem.